Twenty Random Thoughts #221115: How much for the dolphins? 1. 92 dollars to be exact, in addition to the 36 you have to pay to enter Adventure Cove. 2. 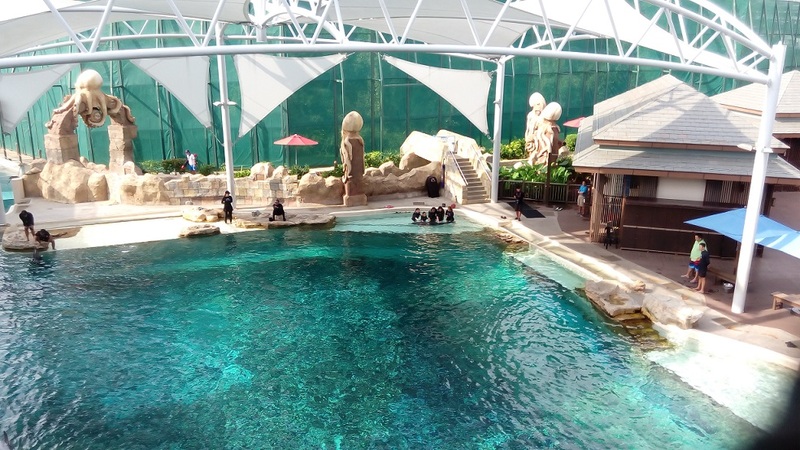 If you're not a fan of dolphins but stingrays, they're slightly cheaper at 20SGD per pax. No catching them for sambal stingray, though. 4. The park itself is fun, though I felt that a significant amount of space was devoted to the premium attractions, ie the Dolphin Island, Shark Encounter and Ray Bay. 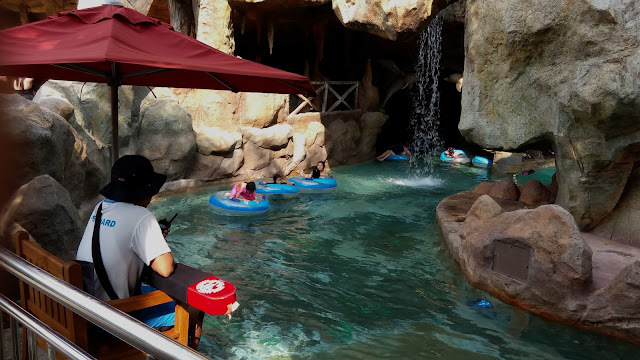 In addition to that, the lazy river also takes up a significant portion of space, with only like 25% of the area allocated for other attractions, ie slides, restaurants etc. 5. There were six slides in total, four of each are next to each other in pairs. My personal favourite is the Riptide Rocket, where they made slides resembling a roller coaster. It's also the longest ride in the park and also the most popular. 6. My second favourite was the Rainbow Reef, where they build a small pond to resemble a reef, so you can go snorkelling without going to the sea. You need to be a confident swimmer, though, for the exact reason, because the water is 3 metres deep. You'll get a life jacket, but it can get intimidating if you've never snorkelled before. SALTWATER: For those who want to snorkel without going into the open sea. 7. I think for the park, they intended for the Adventure River (or lazy river) to be their main attraction, though. The river is quite long, I think it takes about 30 minutes to complete the entire river on foot, and it showcases the different sides of the park, including a preview of the premium attractions. 8. Adventure Cove is enjoyable in general, but it feels like a badly done EA game. You pay for the base game which is the park, but you have to pay more to unlock the DLCs: dolphins, sharks and stingrays. But still if you've never been there before it's an interesting place to visit. 9. One thing that I find amazing about the park is the number of lifeguards they have stationed around. 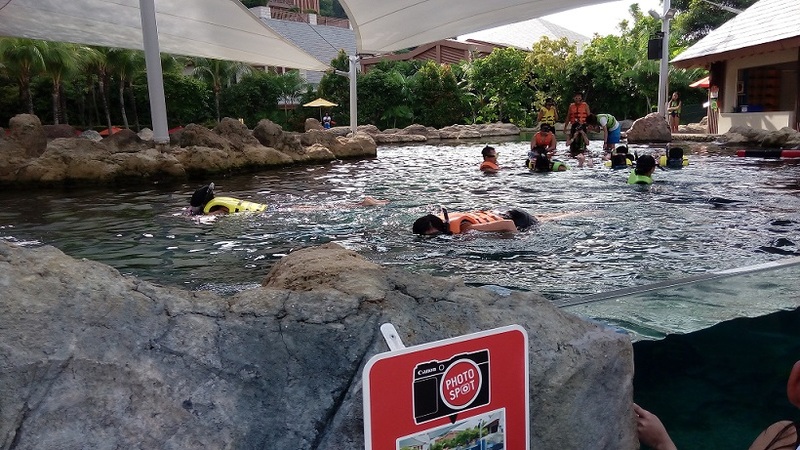 Even at the lazy river there are like one guard every 10+ metres. Dawn and I joked that it's almost impossible to drown in the place with so many eyes watching you. But it's a good thing. 10. Not sure why they would name it Adventure Cove, though. I kept mistaking the place for Sentosa Cove. Just missing a yatch here and there. 11. In other news, Dawn and I will be starting a Youtube travel channel! Hoping that it will turn out well, though. And hoping that we have the discipline to continue it. The pilot episode will be on Adventure Cove! 12. Speaking of that, we will also be travelling to Ho Chi Minh (Saigon) in two weeks time! My next Southeast Asia country after Myanmar. Hope it'll be exciting! 13. Travelling to a new place is always intimidating, which is why you need to be as prepared as possible before making the trip. One such headache is accommodation. 15. I wonder how dangerous it is to ride a motorcycle there? 16. Adele is already hugely popular. And she's 25. I'm also 25. But when I sing hello all I'm getting back is silence. 18. People have already forgotten about Paris, Syria and moved on with their lives. 19. People didn't care about Mali attack, but I supposed it's because we tend to view cities like Mali differently than cities like Paries. 20. Some lives do matter more than others, at least in our eyes.